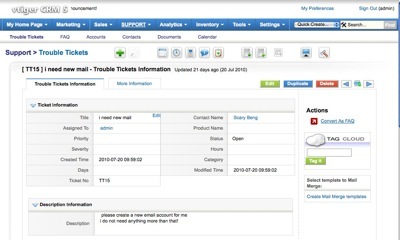 The installation of vTiger CRM is very user friendly. 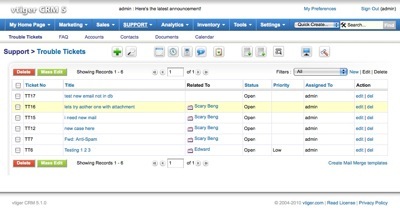 Just that you need to put some time to key in / import your Product and Customer database. So that the trouble ticket can be bind to the correct product and customer. By default, vTiger trouble ticket module does not able to support email to ticket feature. Thanks to the Mail Scanner module, you can easily configure vTiger to receive email from a POP3 email account and it will auto create a trouble ticket according to your criteria. To make vTiger a true support ticketing system, you need to do some customization and setting in the code as well. No worry, there are few articles already published on the net where it teach u how to configure vTiger to auto create trouble ticket from email and auto assignment. This entry was posted on Tuesday, August 10th, 2010 at 1:48 pm	and is filed under Free Helpdesk System. You can follow any responses to this entry through the RSS 2.0 feed. You can leave a response, or trackback from your own site.